India arrived in England as the number 1 Test side in the world and were expected to provide the hosts a tough series. However, they also arrived in the Old Dart with Cheteshwar Pujara and Ishant Sharma having played county cricket, but the rest of the team having failed to play any longer format cricket since the Afghanistan Test. As such, captaincy and team selection were talking points. Virat Kohli sometimes makes perplexing selection calls. The selection of Kuldeep Yadav seemed viable when the weather was dry, a week before the second Test at Lord’s, but on Day 1 the conditions had changed completely, the rain and clouds meaning India needed an additional seamer. The embarrassing loss at Lord’s also showed that some of players aren’t cut out for this level anymore. The India A team, under Rahul Dravid, has been doing extremely well over the last year or so. Their English tour ended on a bad note, losing to a strong Lions side, but the youngsters displayed lots of talent and ability overall. As such, Rishabh Pant, Hanuma Vihari, Prithvi Shaw and Shubman Gill need to be fast-tracked into the Test team, which would mean the end of the road for Cheteshwar Pujara, Murali Vijay and Shikhar Dhawan. Management should also have some tough conversations with Ajinkya Rahane and KL Rahul – especially the former, who was India’s best batsman behind Virat Kohli on India’s last overseas leg. If India want to be competitive overseas in the coming years, the captain and coach should actually start planning for the future. Pujara has been provided with enough rope, but a batting average of 26.32 over 37 innings outside the subcontinent does not inspire any confidence. Vijay was great for India during the last round of tours, but he has regressed and his inability to even blunt out the new ball is a cause for concern. Dinesh Karthik has played his last game in whites and should immediately be replaced by Rishabh Pant. There also needs to be a discussion regarding the role of Hardik Pandya – he is neither a third seamer nor a number six batsman. Bhuvneshwar Kumar, if fit, is a better all-rounder. Kohli needs to make some tough calls before the third Test, at Trent Bridge. Rishabh Pant and Karun Nair should take the spots of Dinesh Karthik and Cheteshwar Pujara. KL Rahul probably will get another go and Murali Vijay possibly will lose out to Dhawan. India also need to think about the bowling options – hopefully Jasprit Bumrah is fit – while they also need to pick Mohammad Siraj, who is a fantastic long-format bowler, with a first-class average of under 20 and a strike rate of 40. 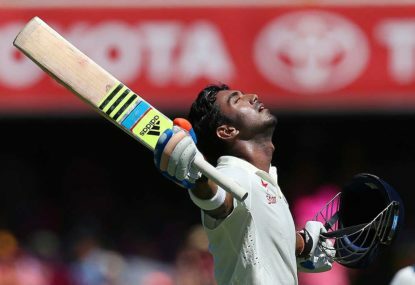 The talent is certainly there, but over the last few years the Test team has hardly seen any changes, with KL Rahul and Karun Nair the only new blood in the mix – and even they haven’t received consistent chances. The team travel to Australia later this year and selecting a young team might not get winning results immediately, but at least will give some hope for the future.